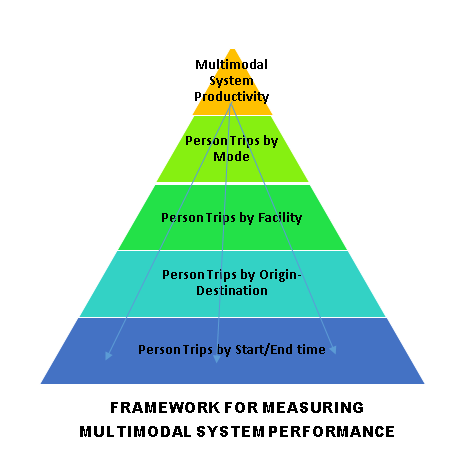 Renaissance was selected by the Federal Highway Administration in the fall of 2015 to lead a research study on measuring multimodal transportation system performance. Such a measure, which would place all modes of transportation on common ground, has long been a challenge to planners and policy makers. Not only do modes like autos, transit, walking and bicycle operate in very different market settings, but the data to support comparable analysis of each mode has been severely lacking. As a result, existing measures of performance have tended to emphasize both the highway side of the transportation system and focus on the movement of vehicles and not users. The study has been given impetus through FHWA’s recent attempts to introduce a system of national transportation system performance measures, as required under MAP-21. By its admission, FHWA was unable to come up with a satisfactory measure or measures of multimodal system performance prior to its draft Notice of Proposed Rule Making (NPRM) in spring 2016, and so this research study is intended to more comprehensively assess those options to guide future responses. A major emphasis in the current study is on evolving data sources that may finally support effective performance measurement. Most notably are the data which are being crowd-sourced from cellphone and mobile navigation (GPS) technology. Broadly known as “big data”, these sources are furnishing massive volumes of real-time travel data, which technicians are transforming into information on actual trips made by people. These data can be linked to mode of travel, facilities used, and conditions (speed, congestion) on those facilities. Renaissance has proposed a concept that would tap these data to create moment-to-moment snapshots of how the transportation system is processing the demands being placed on it. Because the data are streaming, activity can be monitored over time to ascertain person travel times by mode, multimodal throughput, and system reliability at any scale. The final version of the measures will be tested in a set of national pilot tests.